Thanks to our mild winter weather, home gardeners on the central coast can grow vegetables year-round – lading their holiday tables with homegrown kale, carrots, snow peas and broccoli. Mustard, a common cover crop. But just because you can grow vegetables year-round doesn't mean you have to. Winter can also be a time to fallow those raised beds, leaving them to rejuvenate naturally while you put your feet up and browse through seed catalogues. But before you hit the couch, take a fall afternoon to prepare your garden beds to make the most of our rainy winter season. A green cover crop or a straw-covered layer of manure will work slowly over the winter to enrich your soil, attract earthworms, and feed the legions of beneficial microbes needed for healthy spring crops. Both techniques have their pros and cons. Cover crops such as fava beans, vetch and mustard thrive in our winter weather, the beans and vetch teaming up with soil bacteria to pull nitrogen from the air and into the soil. The pros of cover crops include their beauty and variety. Mustard and vetch are spectacular in full bloom, and fava beans grow impressively tall and vibrantly green. Fava beans can also be harvested and eaten. Cover crops offer habitat and food for pollinators, and mustard plants naturally suppress some harmful soil-dwelling nematodes. But cover crop seeds may require watering, at least until winter rains are constant enough to keep the soil evenly moist. And care must be taken to prevent weeds from infesting your cover crop. It's best to plant cover crops before the end of November, and to till them into the soil while they are still green and tender. 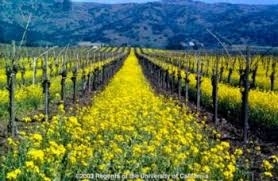 UCSC's Center for Agroecology and Sustainable Food Systems has a great reference for cover crops here. Layering manure and straw onto your planting beds, on the other hand, is a one-and-done deal. Simply pile on 2 or more inches of herbivore-generated manure – horse, cow, goat, llama or bunny leavings are all equally good – and tuck it up with a fluffy layer of straw or dry leaves three times as deep as the manure layer. The straw stays neat-looking for months, and thick layers of organic material will smother most weeds. Winter rains keep the pile moist, attracting earthworms and helpful decomposers. Straw and leaves hold in moisture and prevent rain from compacting the soil. In spring, turn the composted manure and straw into the top layer of soil before planting. The cons of this method include sourcing, transporting and shoveling animal poop, and waiting a couple of days for the barnyard aroma to dissipate. Whichever method you choose, the result will be richer springtime soil with better tilth. And, possibly, a well-rested and ready-to-go gardener.